Net Metering allows for the generation and self-consumption of electricity on your property. The energy produced on your roof is consumed by you. Any extra energy is fed into the grid, for which you receive credits that can be used up to a year later. Read more here. This is your opportunity to stabilize your electricity bills and green your bottom line through a solar system on your own property. The solar system – financed, installed, operated and maintained at no cost to you – allows you to secure low, stable electricity rates for 30 years. Solar power rates are currently competitive with grid electricity prices with predictable escalation that is much less than the grid (see below). Is Your Property a Good Candidate? 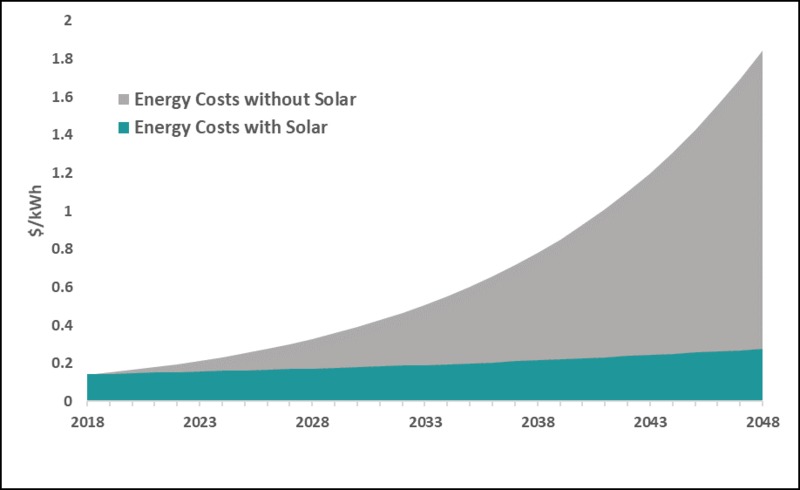 Any commercial or institutional customer with a large enough roof for solar generation (ideally 10,000 ft2 or more) and a demand for electricity in the summer should consider net metering. With that said, we evaluate all requests on a case-by-case basis, and can refer home-owners to one of our partners. How net metering works for a typical property. Complete this form to have an OREC representative contact you about the opportunity to save on your electricity bills. LDCs across Eastern Ontario, such as Hydro Ottawa and Hydro One, allow a net metering customer to generate electricity for their own use from a renewable energy source such as wind, water, solar, biogas, or biomass. Batteries can also be part of a net metered system. There is no size limit on the generation facility. Credits are accumulated for every kWh generated and given a dollar value based on the customer’s rate class and on when the electricity is produced. These credits are then used to offset the electricity charge portion of a customer’s electricity bill not the delivery, fixed, or demand charges. Excess credits can be carried forward for one year. Hydro Ottawa fees to set up a net metering account include the cost of a new meter, an account setup charge, an $18 monthly service charge and, in some circumstances, an administration charge. Read the complete Net Metering Report (1.4 mb PDF) produced by the Ottawa Renewable Energy Co-operative with support from the City of Ottawa. Net metering allows you to install solar panels on your roof or property for your self-consumption. It is the next step in the evolution of Ontario’s solar market. Electricity generated by a solar array is used by the property its built on. It allows consumers to produce power; for their own consumption. During the summer, when an array produces more power than the property uses, the excess power is sent to grid, and in return the property receives credits based on the value of that electricity. These credits can then be used at night or during the winter when days are shorter. What is the cost of the solar system? The Ottawa Renewable Energy Co-operative can finance the project through investments from its members. To date, we have financed 17 projects (as part of the Feed-in Tariff program) in Eastern Ontario entirely through member investment. How long can generation credits be kept for? Generation credits must be used within 11 months from when they are generated. What is the minimum roof or property size for net metering? The minimum space required for the Ottawa Renewable Energy Co-operative to finance a solar array is 10,000 square feet. Who are ideal clients for net-metered installations? Institutional buildings, where ownership is not likely to change over the course of the 20-year power purchase agreement. These are properties like community centres, museums, government buildings, schools, and churches. Ideally, these institutions have a significant energy demand in the summer months, when solar energy production is at its peak. What kind of contract is involved in net metering? Net metered solar projects can be installed, owned and operated by a third party, in this case the Ottawa Renewable Energy Co-operative. The electricity is then sold to you, the property owner, through a 20- or 30-year power purchase agreement (PPA). What would I save on my monthly bill? This varies from property to property, however, our modelling shows an average cost saving of 7-15% per year. Cost savings are divided with the Ottawa Renewable Energy Co-operative. We use our portion of these cost savings to pay back our investors. Will this impact my fixed or demand charges? Net metering credits can only be applied to the per-kilowatt-hour charge on your bill, unless peak occurs when the sun is shining. The only costs you will incur as a property owner are a setup charge ($30), a monthly service charge ($19/month) and, in some circumstances, an administration charge. What are the risks associated with installation? The Co-operative takes on the risks of installation, including insurance. Furthermore, the Co-operative installs panels at a 10ᵒ slope, so roof-penetrating anchors are not required. Panels will be weighed down to ensure safety. With that said, your roof should be in good condition before array. The Ottawa Renewable Energy Co-operative will perform an assessment to determine the viability of your roof for a solar array. Would this reduce my carbon footprint? Yes! While you are not able to claim the renewable carbon certificates (RECs), our modelling shows a reduction of over 25 tonnes of greenhouse gas emissions per year. This amounts to a reduction of over 500 tonnes of greenhouse gas emissions over the lifetime of the contract. Where do you get your solar panels from? We purchase our panels from Canadian Solar. Their headquarters are in Guelph, and they produce their panels in Canada and China. Could this be installed on a residential home? Net metering for the residential sector is allowed. With that said, installing solar panels on residential homes is not cost-effective for the Ottawa Renewable Energy Co-operative. We do encourage residents of Eastern Ontario to become members of the Co-operative, and to invest in net metered projects. Learn more. You will need to provide us with recent data of your energy consumption – ideally, hourly utility data for the most recent full year. We can walk you through that process, depending on who your local distribution company (i.e. Hydro Ottawa, Hydro One). Is this part of the FIT program? No. The Feed-In Tariff program is in the process of wrapping up. Net metering is separate from the Feed-In Tariff program as well as the Green Energy Act. This is the next step in Ontario’s energy transition.